The following diagram shows a simplified view of the The Elm Architecture. The area above the line represents the runtime. CMD, MODEL and NEW MODEL are plain data structures. Whereas UPDATE and VIEW are pure functions. As a young teenager there was a short episode in my life where I was writing test based adventures in BASIC. Neither was I very creative nor did I know much about programming. So that was over quickly. However, it might have inspired the idea of implementing a light weight framework for creating and presenting text based, interactive stories. I know that the idea is not very unique and that there are a lot of way more fancy tools out there (even one written in Elm) but I took the opportunity to get some exercise in the programming language Elm. 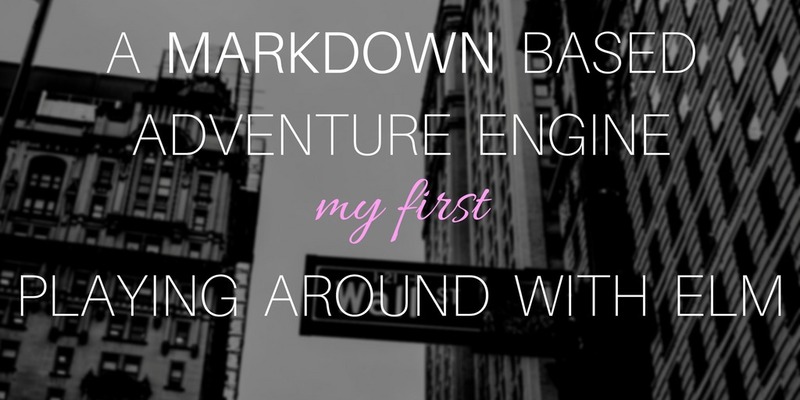 The idea is that you can write your complete interactive story only with Markdown, augmented with a simple additional syntax. The story can be edited by uploading a new file. There is no need to write any Elm code or recompile the app when the story has changed. There are a few rules when writing a story file. A section is an atomic part of the whole story. A sections has to start with ***. After the ID the content of the section starts which can be written in plain Markdown or HTML. At the end of a section there may be links to other sections that the user can choose to navigate to. The list of links is marked with - continue and a new line. Which has to be followed by one or more links. The file that contains the story must be named story.txt and must be placed in the same directory as the Elm app. If you are interested in concrete code examples please take a look at the source code. Getting a little web app up and running with Elm was a really enjoyable experience. The program design of my app, layout of the views and feature set could be improved, but that is not really the point. Check out the Elm website for great documentation and how to get started!